Singing of Havaneres in Calella de Palafrugell Palafrugell 06/07/19. When the summer arrives, the Costa Brava moves to the rhythm of havaneres (colonial shanties). Outdoor concerts are held in many towns featuring groups who perform songs that were brought back from the Caribbean in the 19th century and that have become firmly established in popular Catalan culture. The most eagerly awaited performance is, without a doubt, the Singing of Havaneres in Palafrugell. 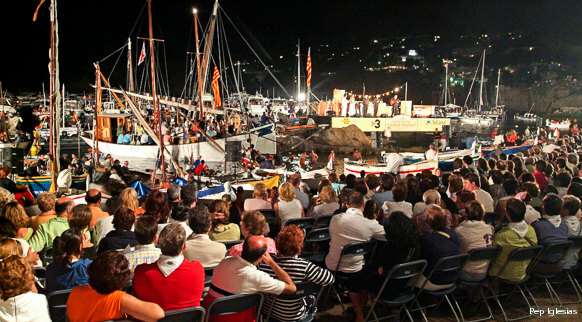 This concert, held on the first Saturday in July since 1966, is one of the major tourist events on the Costa Brava. You couldn't ask for a better setting. With its picturesque white houses, Calella retains all the charm of an old fishing village. Crowds flock to the town for the concert and in the cove of Portbò (where the stage is set up) you can't see the sea for boats, with people keen to enjoy the show from the water as well. If you decide to come, make sure you get here early to avoid parking problems and to get a good vantage point for the concert. It will also give you a chance to have a good look around the Havanera Market, set up in Plaça de l'Església (Church Square). Don't forget to try some cremat (rum flambéed with coffee), the ideal drink to accompany popular havaneres such as La bella Lola (Beautiful Lola) or El meu avi (My Grandfather), two classics that always get the crowd going.